BlueHour launched a photo tour to the best sights in Arizona this past April. We took a small group to areas based on our itinerary in 2017, when Paul was serving as the Artist in Residence at Petrified Forest National Park. We made a big loop, flying into Phoenix, driving to Holbrook & Petrified, to Page, and then south to Grand Canyon and Sedona. We had a blast! One of our first stops was the city of Holbrook, Arizona. This town was once bustling in the heyday of Route 66, and when archaeologists found fossils in Petrified Forest. It still has some interesting remnants ripe for photography, like the Wigwam Motel, complete with some great classic vehicles. Our first "official" shoot of the trip was a new one for us all, at Spider Rock of Canyon de Chelly (pronounced, Canyon de Shay!). We were treated to some spectacular color on the way there, and long after the sun had set, though only our cameras could pick it up. This is why we always try out long exposures, even after the 'main course.' You might be surprised! The next morning, we spent the entire day exploring Petrified Forest, though we couldn't stay until sunset. Unfortunately, with the the cut backs to National Parks, Petrified is understaffed and the park hours have shifted significantly. I know Paul did enjoy bringing others into his Park experience, though. From there, we made our way north to Page, which is home to Horseshoe Bend, slot canyons, and Lake Powell. We took the group on a boat cruise across Lake Powell all the way to Rainbow Bridge, a sacred natural bridge to the surrounding native tribes. It is one of the smallest units under the care of the National Parks Service. Lake Powell itself is an incredible, both man-made and natural feature, whose coastline in total is longer than the entire United States. We documented a part of the cruise using our new 360 degree camera! Our new 360 videos are interactive, meaning you can actually drag the video around 360 degrees using your mouse, or by moving your mobile device from side to side. Try it out! The next part of trip was exploring one of the slot canyons nearby. Page, AZ is very famous for Antelope Canyon, North and South. They offer a lot of abstract compositions and colors, but unfortunately due to their fame, are very, very crowded, expensive, and overall not a comfortable experience where you can take any time to "make your shot." These canyons also belong to the Navajo tribe, as they are part of the reservation land. You cannot simply walk in - you have to be accompanied by a guide. So we decided to try out a very similar, but lesser known canyon called Canyon X. Rather than being pushed through from beginning to end, we had approximately 4 hours to explore two slot canyon areas at a relaxed pace. Our guides taught us how these canyons were formed, and even created these great "sand waterfalls" for us by throwing sand onto the uneven walls. We definitely recommend visiting the lesser known spots! Try clicking around in this 360 still image for a full preview of where we were. Just over the border and into Utah is a short trail to a spot we visited last year: The Toadstools. The trail doesn't look like much, but once you reach the end you'll find tall, columnar spires with rocks resting on top of them like pedestals, hence, "toadstool." This is a great spot to learn how to use Sun Surveyor and to capture the sunset, or, take a silly group photo. Part of the charm of being out west is all of the culture around Historical Rt. 66, now a scenic byway. Cities like Flagstaff and Williams have some of the most preserved stretches of its heyday, like an antique train, neon signs, gas pumps and diners. We love to stop and photograph these cultural icons! After getting our kicks on Rt. 66, we spent an entire day in Grand Canyon National Park on the South Rim. We drove all the way out to the watchtower, and then let everyone have a free day to shoot and explore. We met up at Hopi Point for sunset, a very popular spot for photographers and tourists. We were expecting throngs of people, but not so! Mother nature was ferocious and the winds must have been at least 30-40 mph, with gusts up to 50 - more powerful than what we experience in Iceland even. And, it even snowed a little bit. Despite this and the freezing cold, our group was tenacious, toughed it out, and was rewarded with some killer sunset photos. That's what it's all about! And to top off our trip, we spent a day in Sedona. Sedona is located at the bottom of a valley and is known for its thriving arts, health and healing community. 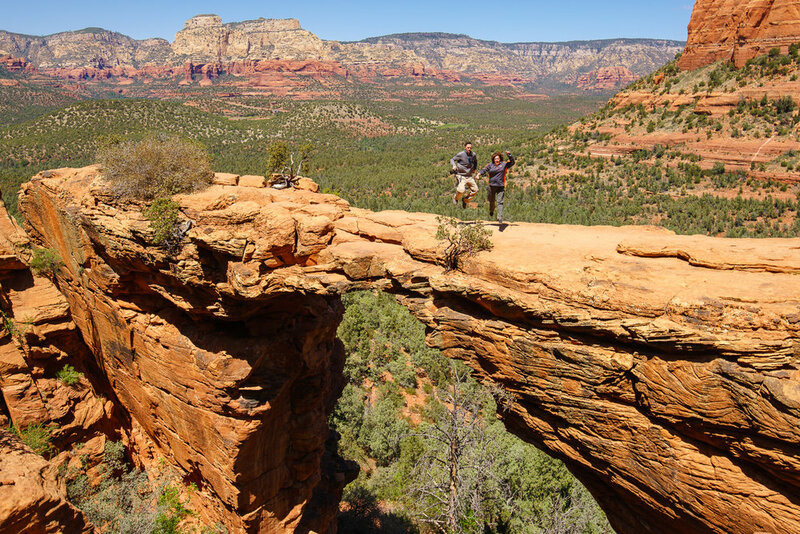 We hiked to the top of Devil's Bridge, the largest natural bridge arch in the area. We explored some of the kitschy shops downtown, and spent sunset photographing Cathedral Rock from Crescent Moon Ranch. We definitely weren't alone for our sunset shooting either - we were joined by a couple of dogs who wanted to cool off in the river. We love this 360 video of them! If you enjoy following along on our travels, consider joining us in person on a tour!